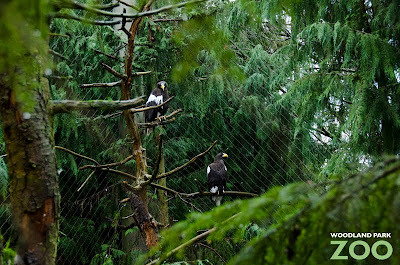 This week a stunning pair of Steller’s sea eagles made their debut in our award-winning Northern Trail exhibit, joining the honorary ranks of the Seattle Seahawks’ 12th Man just in time to salute the Seahawks as they face the Chicago Bears in Sunday’s divisional playoff. The sea eagles’ connection to the Hawks runs deep—the Seahawks actually helped bring these beautiful birds to the zoo! 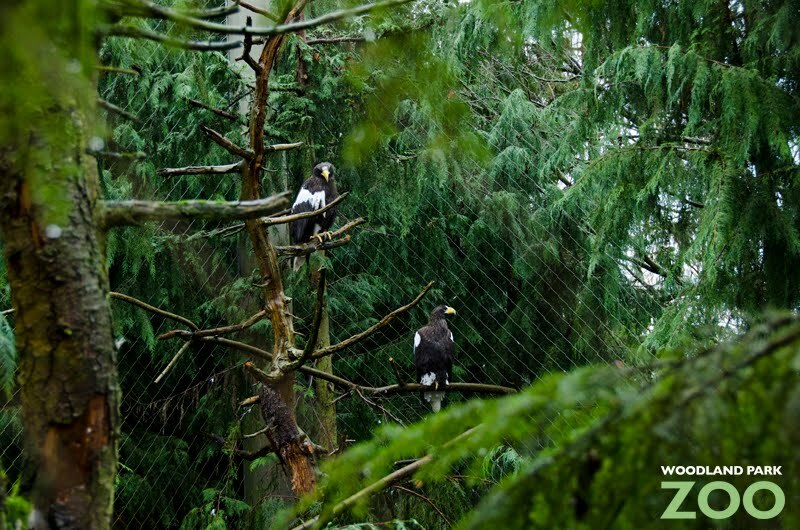 Back in 2008, Seahawks executives co-chaired the zoo’s major fundraiser, Jungle Party, and, under their leadership, helped raise funds to bring the sea eagles to the zoo and support their daily care, including quarantine, veterinary care, nutritional plans and enrichment. So we’re cheering on the Seahawks this week ourselves: visit the zoo this Saturday or Sunday and get a Seahawks #12 button (while supplies last) at either zoo entrance! When you visit, be sure to make your way up to Northern Trail to see these impressive birds in person. 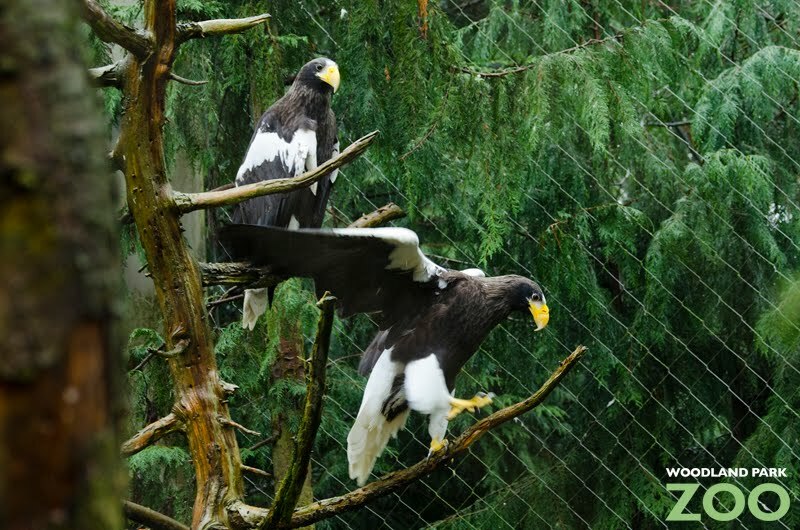 Along with the harpy and Philippine eagles, Steller’s sea eagles have the distinction of being the largest and heaviest eagles, ranging from 11 to 20 pounds with a wingspan of up to 8 feet. Little research has been done on Steller’s sea eagles, which breed on the remote northeast coastal region of Asia. They are an occasional visitor to the Aleutian Islands off the coast of Alaska. 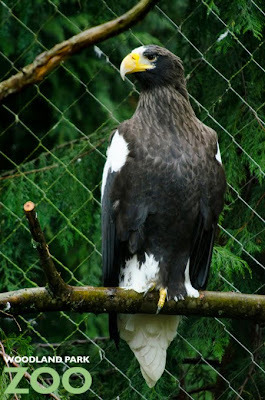 Only 17 Steller’s sea eagles live in North American zoos. Woodland Park Zoo is part of a special conservation effort to breed these rare raptors and this pairs’ genes are particularly valuable to maintaining a diverse population. The eagles, estimated to be 14 years old, do not yet have any offspring but we’re hopeful as the annual breeding season begins now through April. We’ll be sure to update you if there’s good news to share on that front! Great birds, great exhibit, great partnership. Thank you, Seahawks! Where did the bald eagles go? Steller’s sea eagles have a high conservation need and we were in a unique position to help out this species since we have one of the best eagle exhibits in the country. The bald eagles are a successful conservation story, and the pair we had will move to another accredited zoo. Now we’ll be focused on taking on the challenge of helping this other species of eagle. We hope they will successfully breed here and thrive in our climate.